Join us for a discussion on the line between therapy and enhancement, issues of equity and access, and the possibility of making changes that would last through generations. 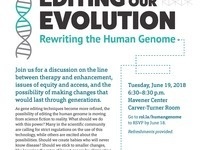 As gene editing techniques become more refined, the possibility of editing the human genome is moving from science fiction to reality. What should we do with this power? Many in the scientific community are calling for strict regulations on the use of this technology, while others are excited about the possibilities. Should we create babies who will never know disease? Should we stick to smaller changes, like lowering the rates of breast cancer by eliminating mutations? Or should we call for society to ban human gene editing? Who should decide? How can we maximize benefits from these scientific advances while minimizing the harm that might come from them?